The conventional utility business model largely succeeded at delivering affordability, safety, and reliability. However, new public policy priorities and emerging trends are accelerating the need for utility business model reform. In “Navigating Utility Business Model Reform: A Practical Guide to Regulatory Design,” America’s Power Plan, Rocky Mountain Institute, and Advanced Energy Economy Institute identify ten approaches to help policymakers and utilities better align utility profits with public policy objectives and five companion case studies providing additional detail on implementation. Utilities need to adapt and respond to several new responsibilities, including environmental performance, resilience, expanded choice, and innovation. Even long-standing responsibilities have evolved and become broader. Environmental performance: The electricity sector generates more than a quarter of all U.S. greenhouse gas emissions, making utilities vital partners to reduce emissions, electrify heating and transportation, and cut local air pollution . 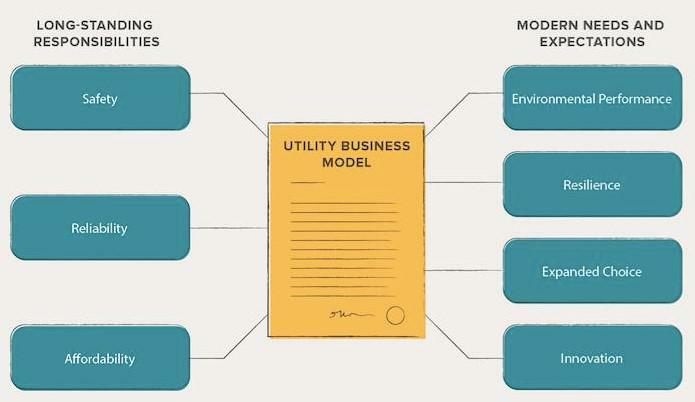 The traditional utility business model is often at odds with emissions reductions, economic deployment of distributed energy resources (DERs) and energy efficiency measures, and flexible grid operation to complement variable renewable energy resources like wind and solar. This is particularly true where utilities or their holding companies, own and operate fossil fuel power plants. Resilience: Utilities have assumed new customer protection burdensdue to cybersecurity threats and increased extreme weather. Meanwhile, digitization and data collection will increase power grid vulnerabilities. Utilities must implement the right tools to protect consumers through this multifaceted transition, without imposing onerous costs. Expanded choice: Utilities can lower bills and improve customer satisfaction by providing access to technologies such as local solar, storage, efficiency, demand response, and in-home automation. Maryland’s Behavioral Demand Response Program shows how utilities can respond to this responsibility: Baltimore Gas & Electric (BGE) significantly reduced summertime demand from air-conditioning through customer rebates that cut consumption during peak-demand days, peaking at 336 megawatts’ (MW) demand reduction that saved customers $11 million in 2016. But the current utility business model typically supports monolithic top-down planning and utility-owned resource procurement on behalf of customers. Utilities complicate this dynamic because they can create more shareholder value by investing in large capital projects, undermining their motivation to accommodate non-utility customer choices. Innovation: The pace of technological change for utilities has accelerated, but their business model hasn’t kept up . Utilities recover costs through backward-looking investment planning processes called rate cases, which determine whether utilities can recover the investment costs they have made and plan to make. To meet the cost recovery threshold, utilities must demonstrate their investment was prudent; however, innovative technologies and programs carry higher risks of failure than proven infrastructure-based solutions. Risk of experimentation or shifting from an existing asset to a new class of assets is put entirely on the utility, with no upside. This lack of flexibility means that utilities are punished for pursuing innovation that provides grid benefits and the best possible service to consumers. The report addresses four main issues with the current utility business model and provides pragmatic options to solve the issues. Revenue Decoupling: Break the link between how much energy a utility delivers to customers and how much revenue it collects. Multi-year Rate Plans: Fix the time between utility rate cases and compensate utilities based on forecast efficient expenditures rather than historical costs of service. Shared Savings Mechanisms: Reward utilities for reducing expenditures from a baseline or projection by allowing them to retain some savings as profit. 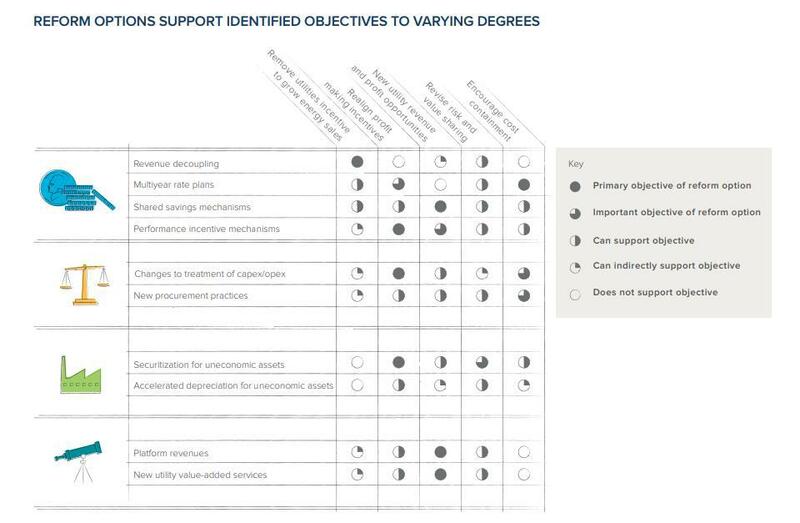 Performance Incentive Mechanisms (PIMs): Create financial incentives for utilities to achieve performance outcomes and targets consistent with customer and public policy interests. Regulators set the rate of return on utility investments. The more utilities build, the more opportunity they create to make a profit, while operational savings do not yield long-term profits. Changes to Treatment of CapEx/OpEx: Change the regulatory treatment of CapEx and OpEx to make utilities indifferent between capital and operational solutions. New Procurement Practices: Expand utility resource procurement approaches to provide customers with the most cost-effective combination of supply- and demand-side resources. Securitization: Refinance uneconomic utility-owned assets by creating a debt security or bond to pay down an early-retiring plant’s undepreciated capital balance. Accelerated Depreciation: Adjust rates to speed up asset depreciationso the utility and its customers are not left with stranded costs when an asset retires early. Platform Revenues: Provide utilities with new revenues for integrating and coordinating third-party energy services and distribution system resources. Utilities should benefit from offering customers more value than what they are required to provide. New grid technologies can generate revenue or increase cost savings for utilities, but regulators must provide a framework for different kinds of transactions between utilities, customers, and third-parties. New Utility Value-Added Services: Provide utilities with the opportunity to earn revenues for offering customers enhanced services made possible by new grid technologies. The last 100 years of utility regulation can be considered a resounding success; utilities have succeeded in delivering safe, reliable, and affordable electricity across the U.S. – but circumstances have changed. The current utility business model will continue to rub up against public policy goals around the country if regulators don’t take on meaningful reform. This will allow utilities to improve their bottom line while achieving a clean, affordable, reliable electricity grid.